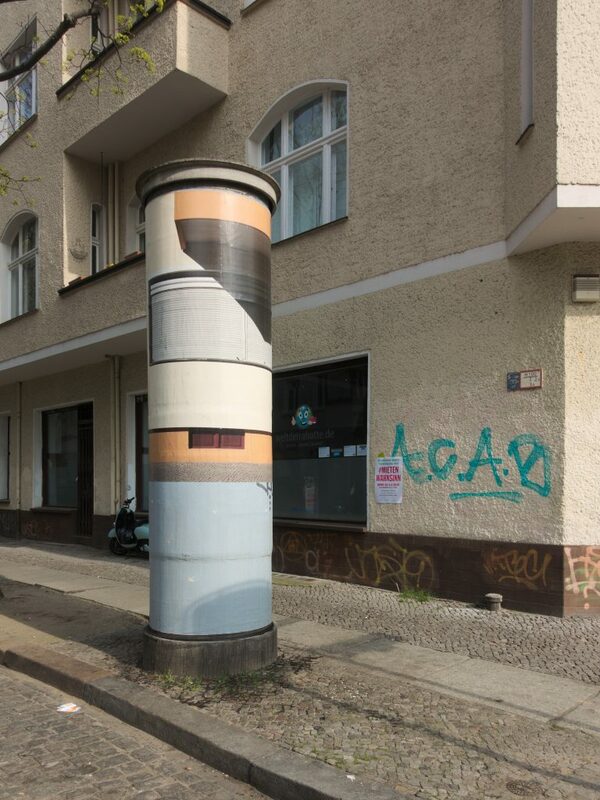 The Litfaß column – invented in 1854 by Berliner Ernst Litfaß – stands on a shaky foundation. 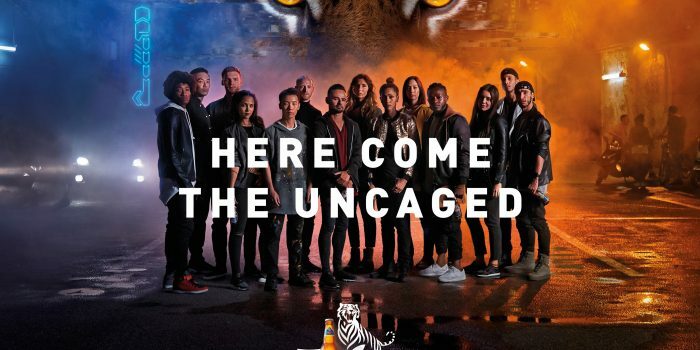 The reason for this is the change in outdoor advertising. 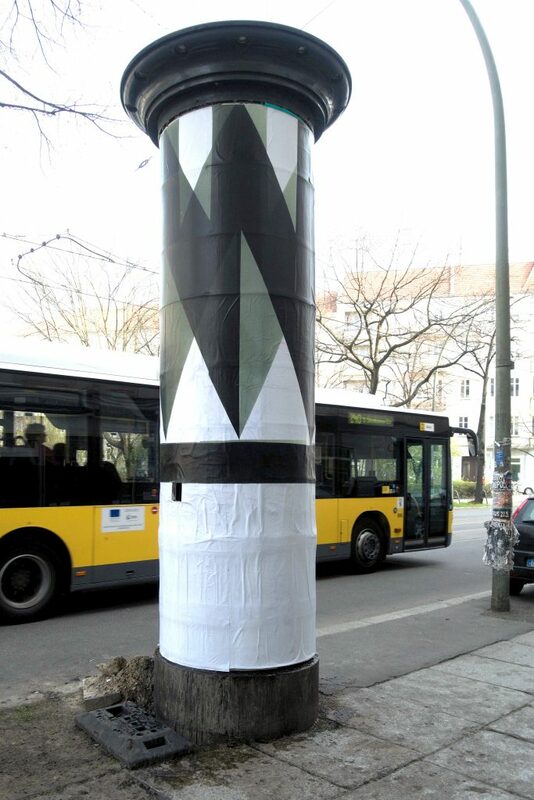 Until last year the WALL AG had the Litfaß poster columns under contract, now after the new call for tenders of the Senate, the ILG-Außenwerbung from Stuttgart takes over these advertising surfaces. Condition: the old reconstructed columns from the post-war period must be replaced by newer ones by mid-2019. 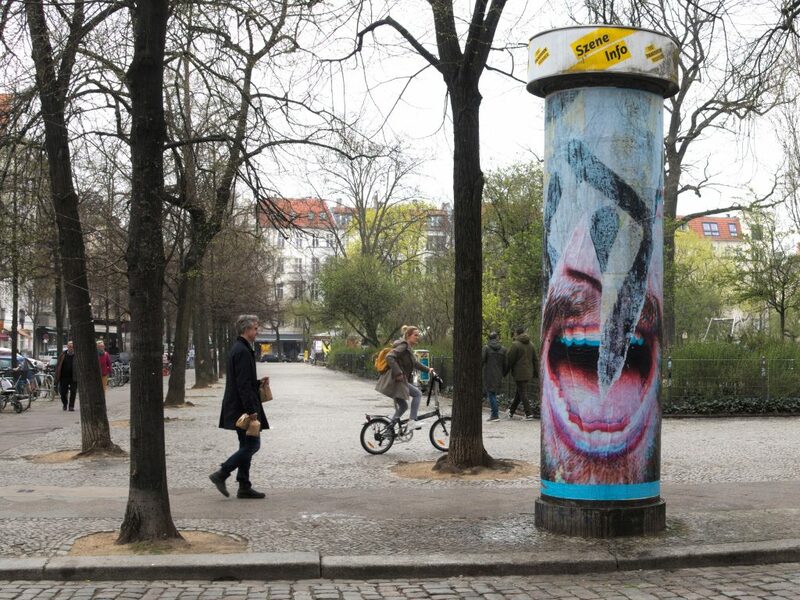 Until then, the contract stipulates that the old columns must no longer be covered by ads. 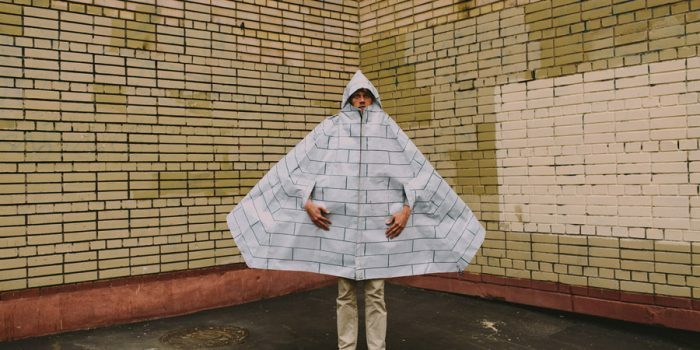 Now they are standing in the city in „monochrome coats“ in great different colors like blue, pink or red and are properly inviting artists to work on them. 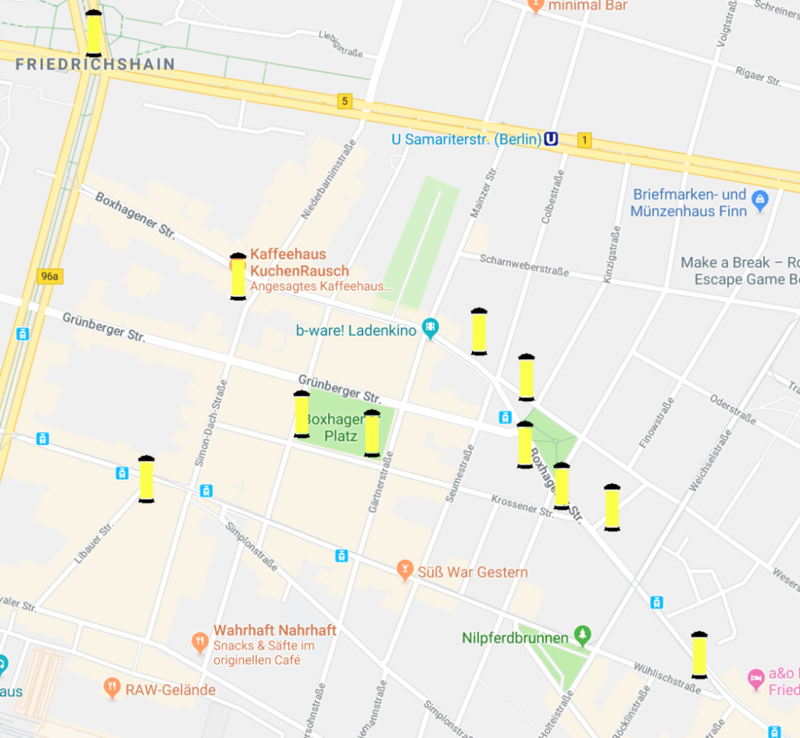 Since two or three months now, works by artists have been discovered here and there on columns in different areas, as well as tags and slogans such as „Maintain the Litfaß columns!“. 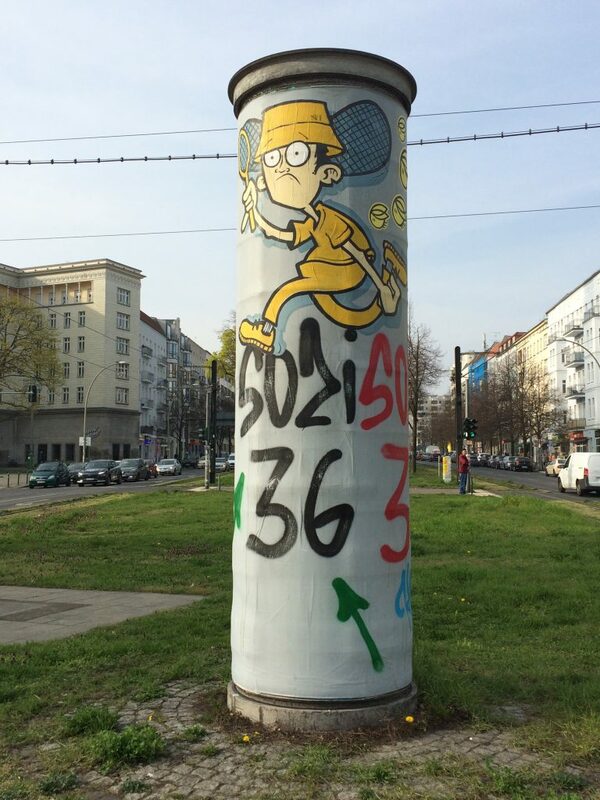 It seems as if many Berliners are attached to these „analog“ columns. 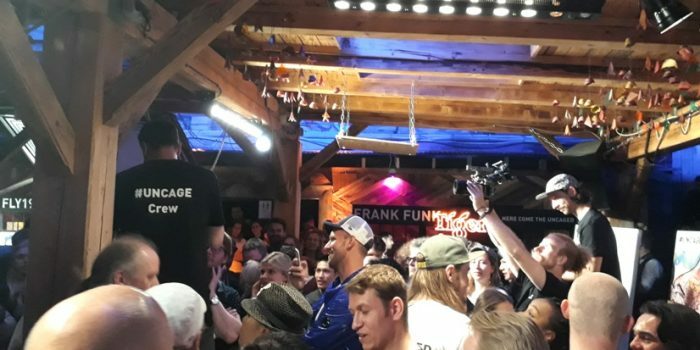 In 2016, 200 years of Litfaß were celebrated, and now they are being torn down? 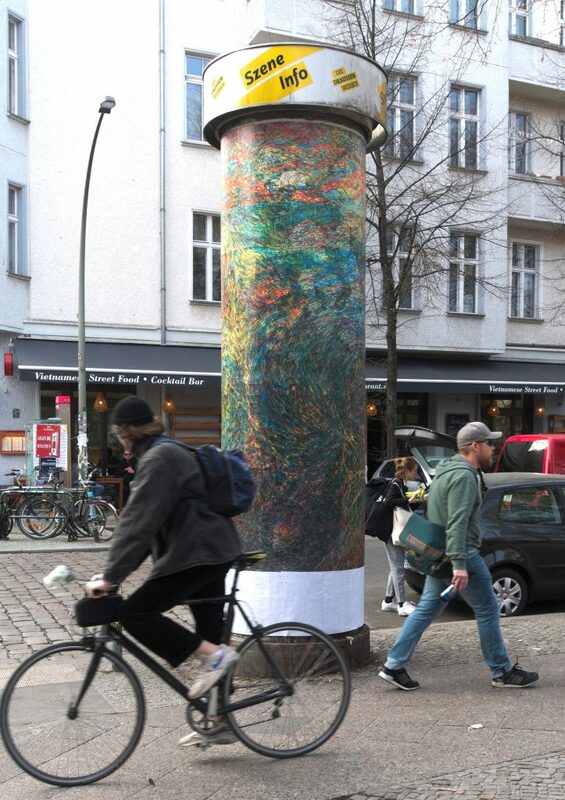 A piece of Berlin’s history is getting lost, it is the end of a culture of pasting with paper and a further step towards the modernization of advertising spaces in the city: plastic columns, rotating with electricity…very environmentally friendly! 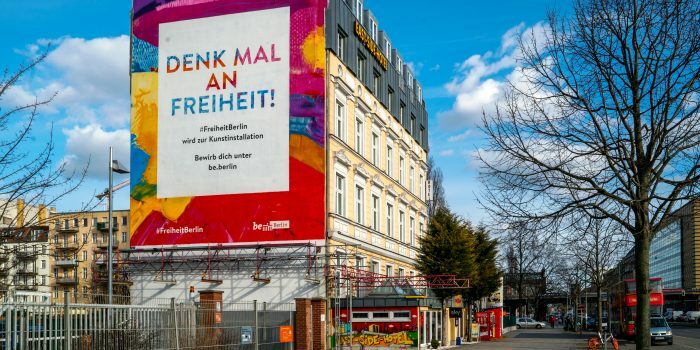 This sale and forced modernization in Berlin is once again a great example of the contradictions of our times and a strange priority of the Senate of Berlin. 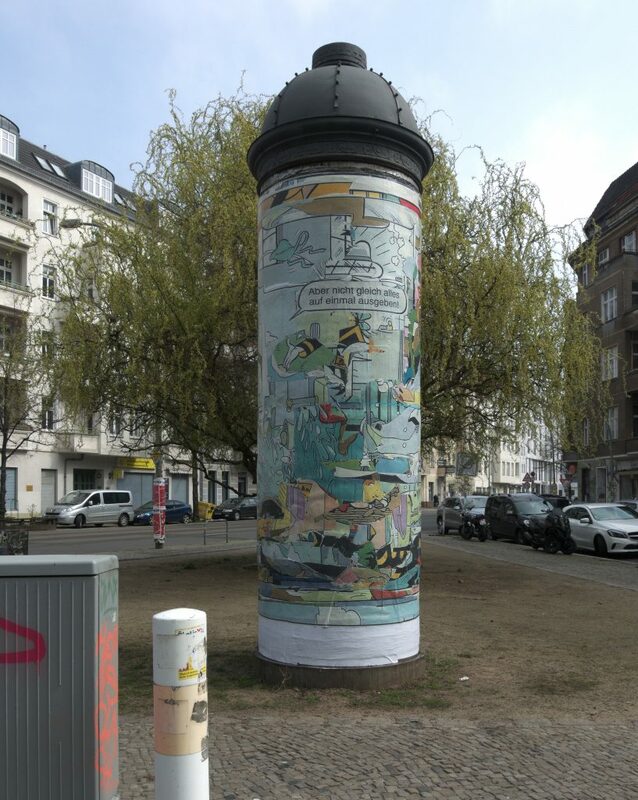 Yesterday an art action with the hashtag #litfassgoesurbanart in Berlin-Friedrichshain transformed nine of the Litfaß columns into artworks. 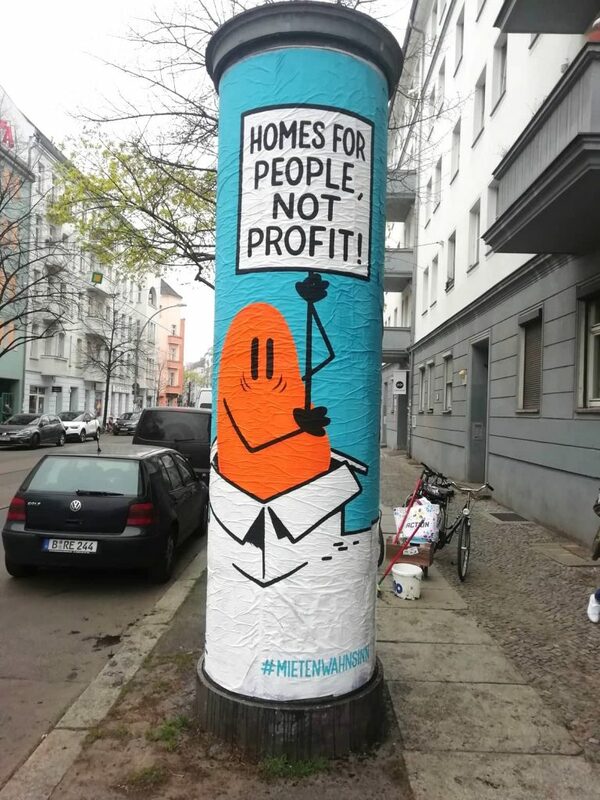 Dave the Chimp designed one with two motifs: a political statement against the „Mietenwahnsinn“(rental insanity; related to the march against the rent increase on 7.04.2019). 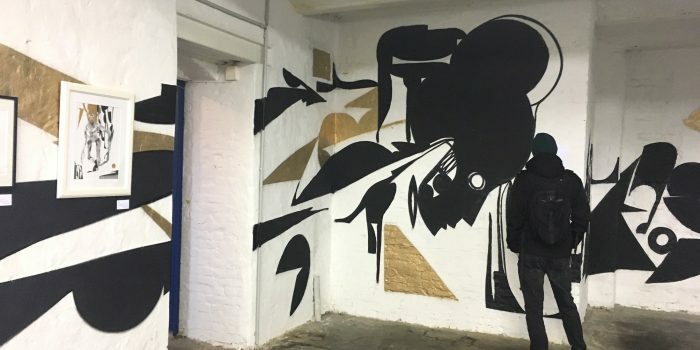 SOZI36 had already painted one, and Marini Coloretti and f.d. 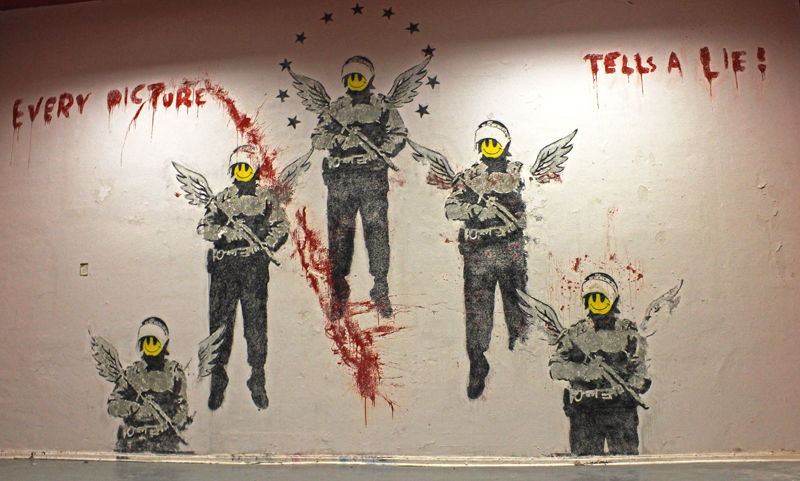 Katz, respectfully added a character above it, a man who runs after yellow ladybirds with a net. 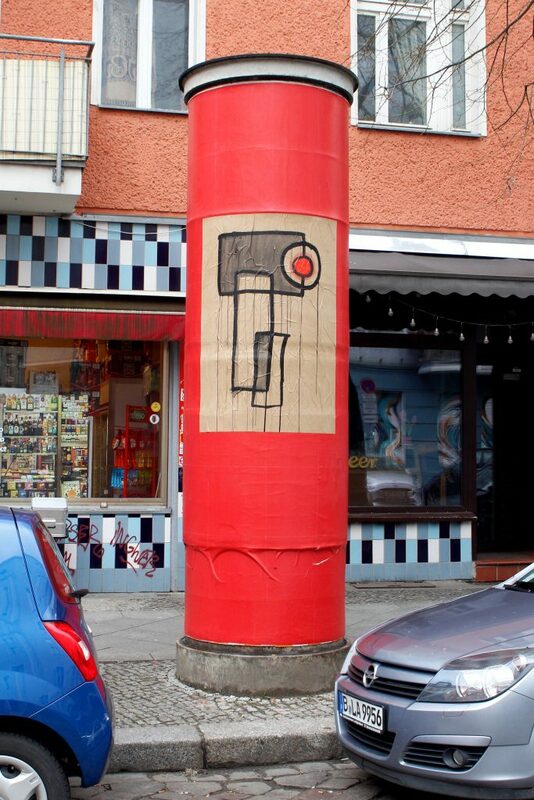 Marini Coloretti also created a minimalist collage on a bright red one. 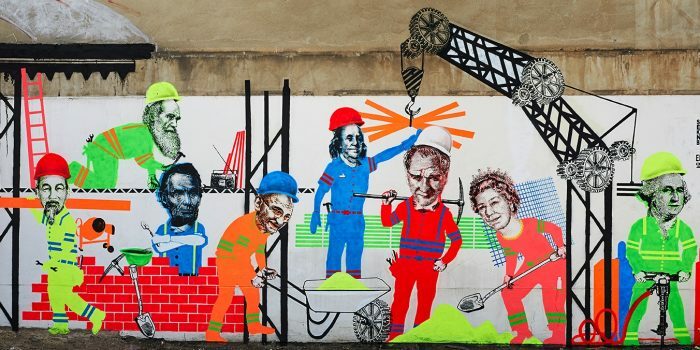 Mesiasoners aka Mesy, Marycula and friends created a collective collage with the saying: „Men, I have lived here since 1855“, made of paste ups and stencils, portraits and animals, for instance a portrait of activist Greta. LC surprises with an abstract architectural photo installation that perfectly matches the colors of the surrounding houses. Garlichs also worked with abstract motifs. 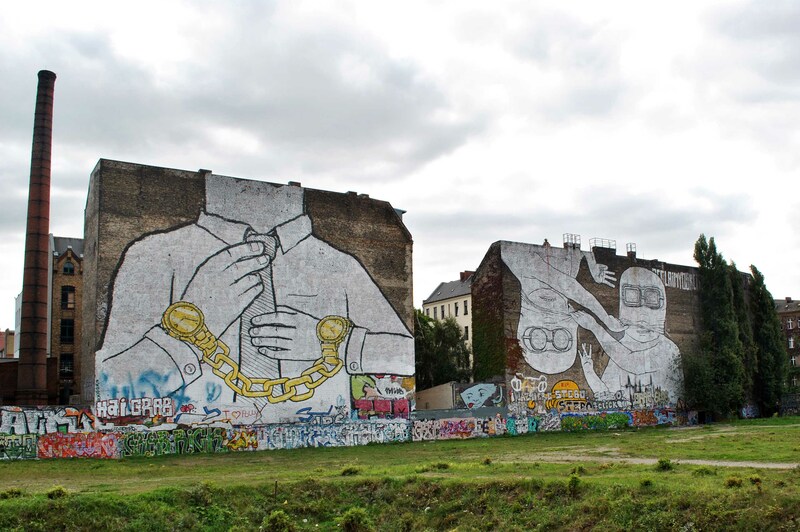 Wolf created a black-and-white drawing with the question: Who owns the city? 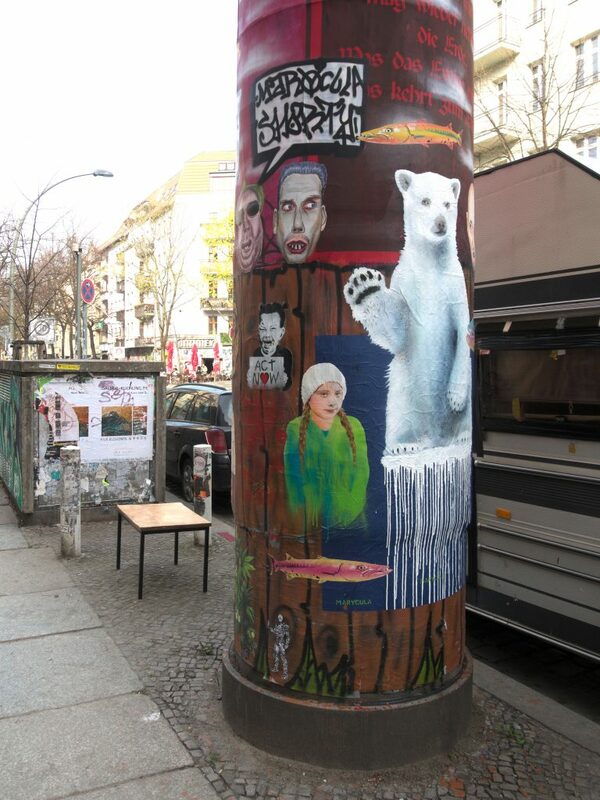 Achim Menzel did a collage with excerpts from a Mickey Mouse comic at Boxhagener Straße and Teichmann added an „impressionistic“ colorful collage. 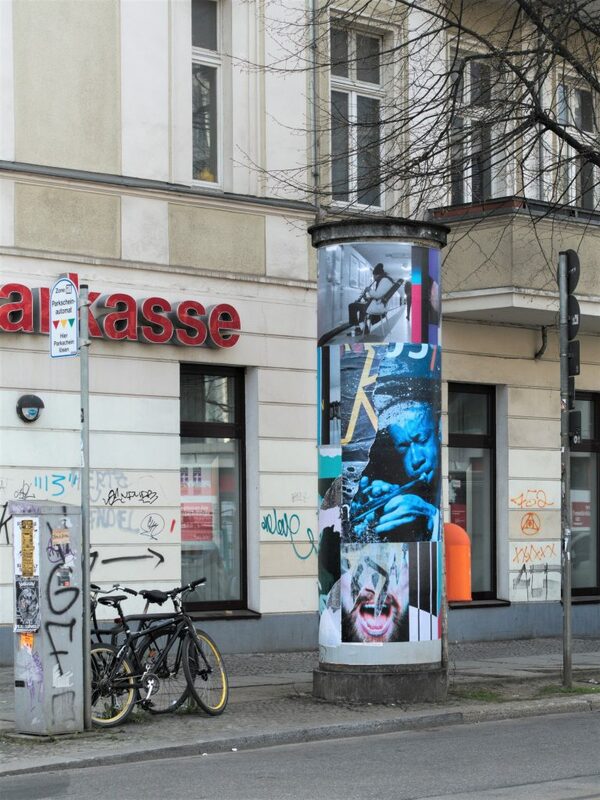 Der Anonyme Plakatabriss (anonymous poster demolition) pasted two columns with old poster remains, one dedicated to Jazz and the other with the big mouth and a scream of anger! 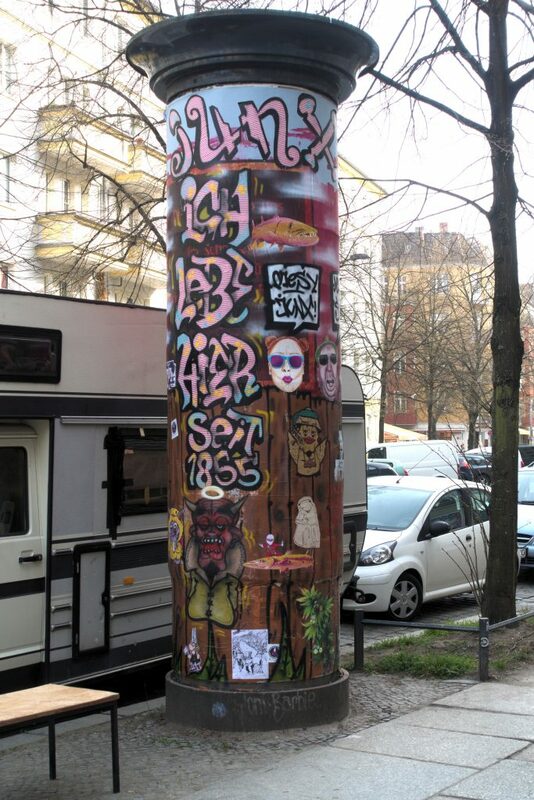 One can only hope that it will inspire more artists to quickly work on more columns before they disappear. 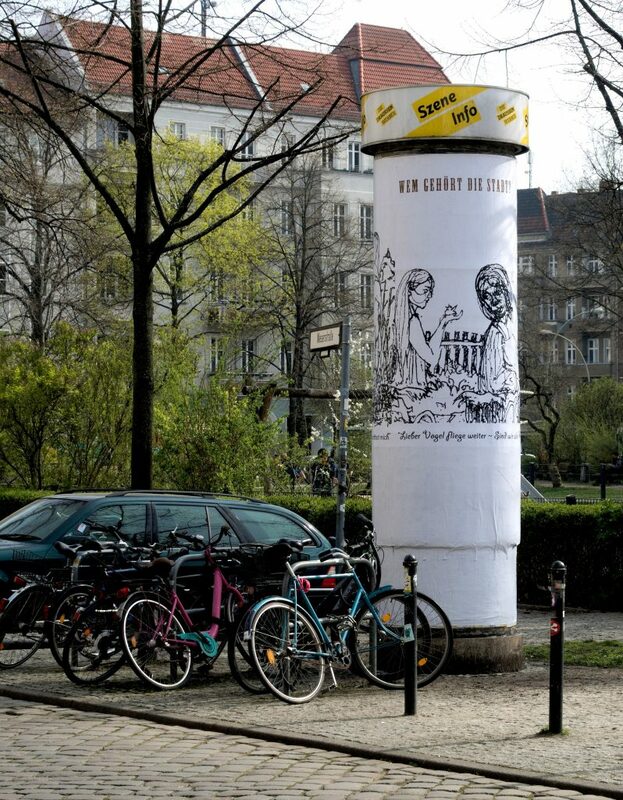 It’s a pity that no petition has been started yet to save at least some of the 1500 Litfaß columns. It would also be clever to leave a few for free art actions. 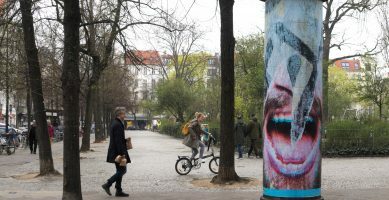 In the end, the city of Berlin advertises with its street art/urban art and its „Freiheit Berlin“ campaign, right? 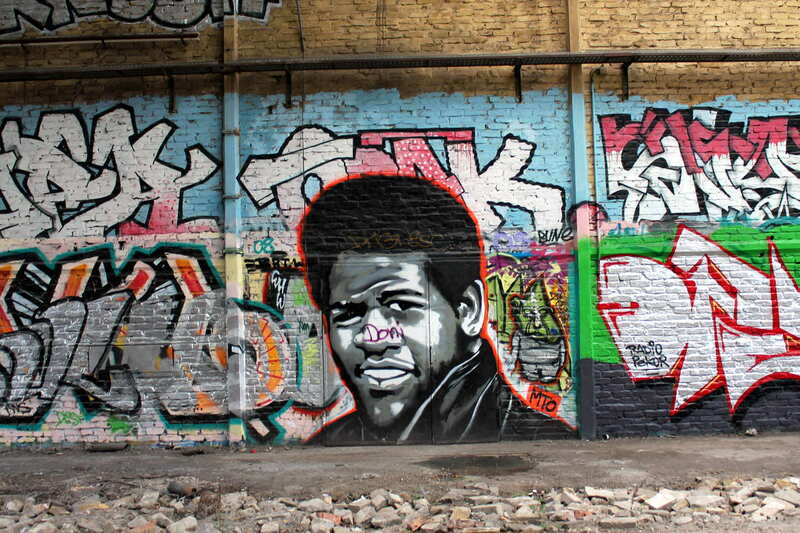 But it the end, it is exactly what urban art is all about: appropriating space and surfaces for public, temporary and non-commercial artworks. 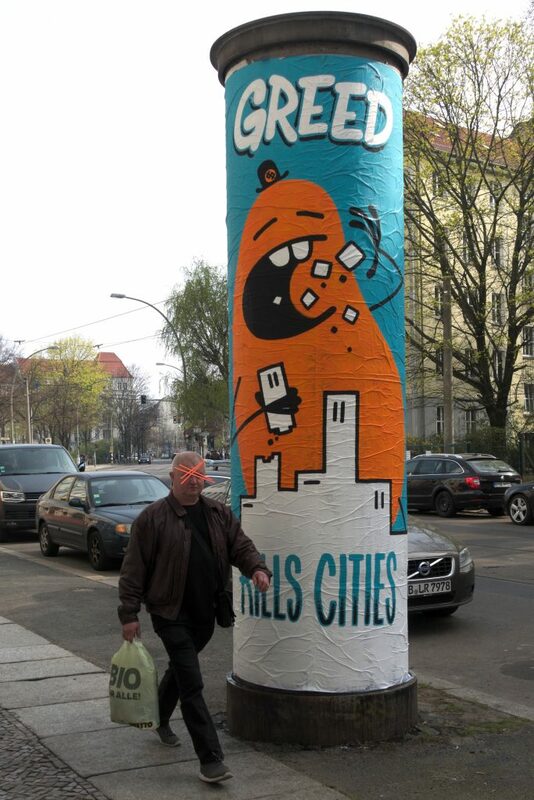 This action once again shows how fast, dynamic and creative Berlin artists act in urban space, and it’s a real pleasure to be able to experience this.